£230 Covers a "Hug in a Hamper"
We are delighted to now be registered with Amazon Smile which means every time you shop with Amazon they will donate to us. Simply visit Amazon Smile and select Pete's Dragons from the list of charitable organisations. From then onwards Amazon will give 0.5% of the net purchase price (excluding VAT and other shipping fees) of eligible AmazonSmile purchases to us. You can use our Virgin Money Giving to make a one off donation, a regular donation and to fundraise for us (be sure to tell us so we can promote you and cheer you on through our social pages!). 100% of the money raised comes to us when using Virgin Money Giving. Simply click on the Virgin Money Giving logo and follow the instructions. Pete's Dragons have launched on Torbay Lottery!!! Support us and win prizes - it's a win win!! You can use our JustGiving to make a one off donation, give a monthly donation or set up a fundraising page to raise money for us while tackling your own personal challenge (be sure to tell us so we can promote you and cheer you on through our social pages!). Simply click on the JustGiving logo to access our page and follow the instructions. 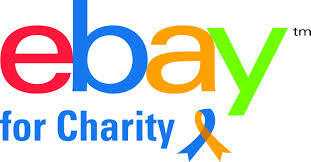 Donating by selling on ebay easy. Simply go to our ebay page and click Sell an item and then choose how much of the sale price you want to donate to us (anything between 10%-100%). If the item sells you are paid by the buyer and you post the item. PayPal Giving Fund collects the donation from the you, claims Gift Aid on your behalf, and passes on 100% of the funds raised to us. Whenever you buy anything online you can raise a free donation for Pete's Dragons . Go to EasyFundraising and sign up. Search for the retailer you'd like to shop with and make your purchase. The price is the same as if you’d visited the retailer directly. A donation is made to us after you've made your purchase. No cost, no catch! Please be assured that this will not cost you a penny. There are no catches or hidden charges.